There are two main types of pictures in Musicnizer: album covers (album art, cover art) and photos of artists. The first type refers to music albums, the second one is for artists. Additionally, there are other types: back cover, CD label, user image for albums and user image for artists. There are 3 pictures on the screenshot: main cover (on the left), back cover (on the right), photo of the artist / band (in the middle). Images that you add from your computer get the "User image" type (both for artists and for albums). The main cover / photo is the one that is displayed in the lists and on the page of the album / artist (see the first screenshot in this article). Each album and artist may have many covers / photos, but only one of them is displayed everywhere. If it's a picture of a wrong type (for example, "User image" instead of "Photo"), right-click it and select the correct type first. From files automatically, when you add your albums from files and folders. When you download information about albums and artists, Musicnizer will download covers and photos according to your download settings. From files on your computer, using the green plus button on the "Pictures" tab of the "Edit info" window. Alternatively, you can drag pictures from Windows Explorer and drop them to the corresponding page. 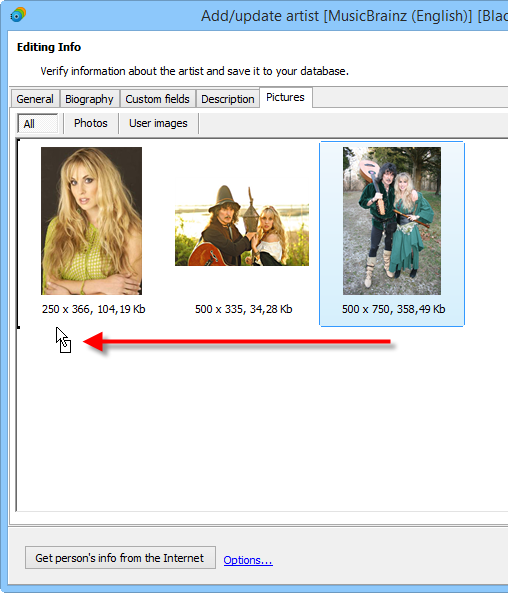 When you add albums from files, Musicnizer can automatically download photos of artists. When you click any picture in Musicnizer, a new window with the same picture pops up. This is the built-in image viewer. The "Previous" / "Next" buttons allow to browse all pictures of the current album / artist. "Fixed / Original size" enables or disable scaling (see also the "General" tab of the "Options" window). The "Delete" button removes the current picture from your Musicnizer catalog. If you added the picture from file, the source file is not deleted. Using the "Save" button, you can save the current picture to any folder of your computer. "Show in the center" defines where the Picture Viewer's window appears. If this option is not enabled, the window remembers the position of its left upper corner. If it is enabled, the picture viewer will be centered.